Toku Toy Box continues today with TokuNation.com’s first official look at product from the 2017 Power Rangers Movie! With Movie toys having just hit stores in recent weeks we finally ran across the Movie T-Rex Battle Zord out in the wild and figure, what better time to do a full gallery & review! 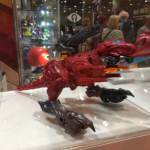 The T-Rex Battle Zord is a behemoth toy. As a part of the colossal Movie Megaord, it’s no surprise that this figure makes up the bulk of it’s mass. Contributing the chest/upper torso, arms, cannon, tail whip/sword, and part of the wings, the T-Rex has a lot to offer. But the majority of it’s play value right now comes from it’s dino mode. Without the other 4 zords on the market, the T-Rex is more fun as a T-Rex. With pressure firing missile launchers, an electronic cannon with phrases & sounds effect, and a really neat mini pilot feature, the T-Rex Battle Zord is a great entry point to this line for fans. We’ve attached a selection of images to this post but feel free to check out the complete 60+ image gallery after the jump. Just click, “Discuss on the TokuNation Forums” at the bottom of this post. We’ll be back in two more days with another Toku Toy Box gallery! Based on the new Power Rangers movie coming in March, battle like a Power Ranger from the film with the Red Ranger’s Power Sword! Hear the Red Ranger speak to you as you play! Slide your hand into this replica of the sword wielded by the Red Ranger, and see it light up! Engage Training Mode to gain combat advice from the Rangers. Switch to Battle Mode to hear battle sounds as you take the fight to Rita Repulsa. The motion-sensor enhanced sound effects activate when you swing and make contact with the enemy. This sword delivers a battle roleplay experience that captures the emotion and power of the new film! Based on the new Power Rangers movie coming in March, it’s Morphing Time! 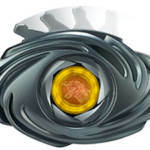 Morph into a Power Ranger from the new film with the Morpher and Power Coins! Insert coins to activate LED lights and sounds based on the film. Insert any Ranger coin to active the morphin sequence. Includes all five Ranger coins. Based on the new Power Rangers movie coming in March, take down villains with the Power Rangers Movie T Rex Epic Battle Zord that includes a figure! Featuring missle-firing action, explosing sounds, and a 2″ tall Red Ranger figure, the Dino Zord includes movie-accurate sounds. The Red Ranger will sit in the Zord’s mouth cockpit, and from there he can strafe enemies with the Zord’s back-mounted missile cannon! Combine the Dino Zord with other DX Zords to create the massive 24″ tall Megazord! Bandai UK have just posted a new selection of in-hand images of the upcoming Power Rangers Legacy Thunder Megazord set! These new images show off for the first time in hand just how the “sled mode” with the Thunderzord Assault Team looks. And it’s VERY impressive. Expected to start hitting store shelves & online retailers next month, the Legacy Thunder Megazord is probably the most anticipated Power Rangers release of 2016. Share your thoughts with us on this impressive set in the thread below! Have you gotten in a pre-order for this mighty impressive set yet? Look no further than our friends & site sponsor BigBadToyStore to do so!